Iron deficiency is the world’s leading nutritional ailment, particularly in developing countries. It can impair cognitive and physical development in children, while anemia, often caused by iron deficiency, increases risks to women during childbirth. Despite efforts to curb iron deficiency through supplements and fortified foods, the condition affects an estimated 2 billion people worldwide. Millions of women across Africa suffer from iron deficiency. Benefiting from a diet high in micronutrients is a challenge for vulnerable populations in Uganda, where beans are a staple crop. Using meso-American beans conserved in the CIAT genebank that are naturally high in iron, scientists bred varieties to adapt to tropical environments with acceptable traits like color and other qualities. The new high iron beans were bred by the National Agriculture Research Organization (NARO) with support from HarvestPlus, USAID Feed the Future and CIAT, using conventional breeding methods. Research for developing high iron beans and their delivery was supported by PABRA. The five varieties released in Uganda, also known as NAROBEAN 1, 2, 3 4C, and 5C, were part of a government strategy to tackle malnutrition. 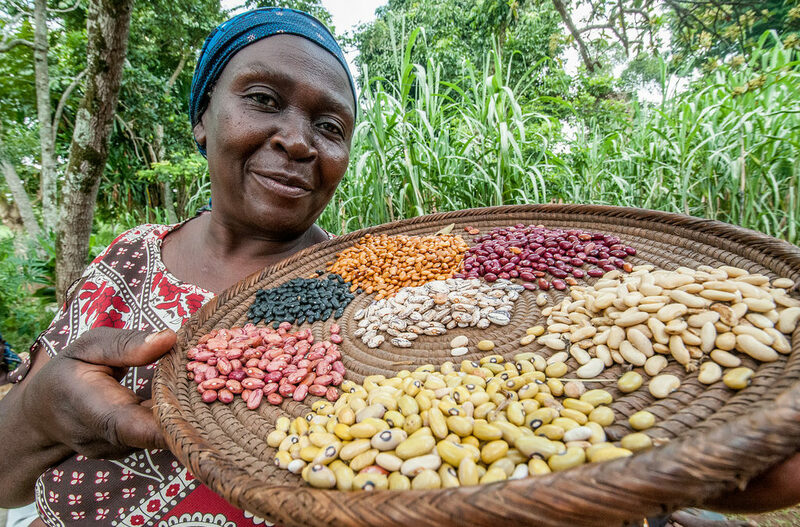 Instead of buying expensive supplements, communities can now buy and grow these beans as a way of boosting nutrition and reducing anemia – a major health concern in Uganda. Farmers in Uganda now have more varieties to choose from; three of the released varieties are bush beans and two are climbers. CIAT’s study in Rwanda found that consumption of iron fortified beans significantly improved iron levels. This data, applicable to similar populations, is not only good news for Uganda but also bean-producing countries across Africa, where iron deficiency is also widespread.